Since this first came out I have been really curious to try it!! It sounds like such an amazing idea and a great product! 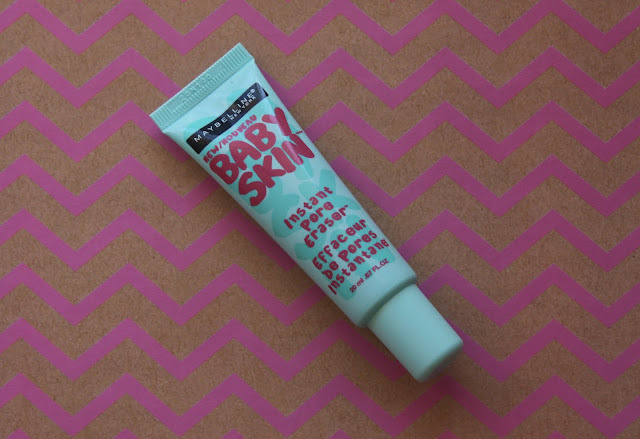 The packaging is super cute and who wouldn't want skin like a baby!! That sounds amazing! Here's what I thought about this product! This product claims to erase your pores! I wouldn't go as far to say that they are erased, though this product does fill in the pores and gives a lovely soft surface for makeup to be applied to! This definitely makes your foundation go on smoother! It is lovely for that purpose! However this doesn't make your makeup last any longer. This product has a very siliconey texture to it! It's also very thick! That can be a positive or a negative depending on the type of products you like. I have also heard that this brakes people out! Thankfully that didn't happen to me!! I will for sure finish this product, I am not certain that I will repurchase it though! This is a lovely product and if you're looking for a cheap primer or pore filler than this will work for you! However there are plenty of primers on the market that I have tried that impressed me slightly more than this one did! I don't think this is a horrible product, in fact I don't even think its a bad product! I just think that you could find a better primer for close to the same price! I found this at Chemist Warehouse for $13. A great primer that I love is the NYX photo-loving primer! You can find this at target for around $14!! I hope you found this post helpful! Have you tried this product?